Red Chile Sauce is a perfect marinade base. In part two of this video, El Pinto Executive Chef prepares a sea food marinade using Red Chile Sauce, an Italian vinaigrette, and fresh lime. This is a quick and tasty summer meal for the grill that will impress your friends. Wrap your shrimp in green chile for extra spice. 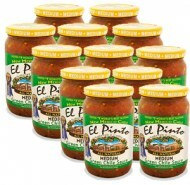 Enjoy El Pinto Red Chile (Enchilada) Sauce for a gluten free meal tonight. It is available at thousands of stores nationwide, but if it is not in yours, order online direct from El Pinto.